In this earlier blog post, a selection of images depicting the olfactory epithelium were arranged in order from those with an anatomical appearance to those that were most diagrammatic. Here, the same process has been followed for some of the visual elements that were identified in this post, albeit with less examples shown in each case, to prevent this post from becoming too long. The six visual elements chosen were: the human brain; rat brain; the hypothalamus/pituitary; olfactory/trigeminal nerves; nuclei; neurons. The example images shown are a small, but representative, subset of a large number of figures collected mainly from the internet. Comments are made after each set of images, with conclusions drawn at the end of the post. Conducting an internet search for images of the human brain inevitably brings up a lot of anatomical images. However, the majority of the conceptual figures use the brain more as a ‘background’ image, in order to give context to the main subject of the figure, such as systems or pathways. This context can range from what is still a detailed, and accurate, anatomical representation of the brain, to a relatively straightforward outline of the main areas. Most of these images show the brain in cross-section. The final image included above has what appears to be an anatomical image of an intact brain, but this merely serves as a background for the geometric shapes that represent the areas of interest. In this example, a simple outline of the brain may have provided a clearer visual representation. Most images of a rat brain will only be of interest to scientists working with animal models, so there are less purely anatomical figures. As in the human brain images, the rat brain is often used to give context to the subject of the figure, with the distinctive olfactory bulb and cerebellum being included in even simple outline representations of the brain. 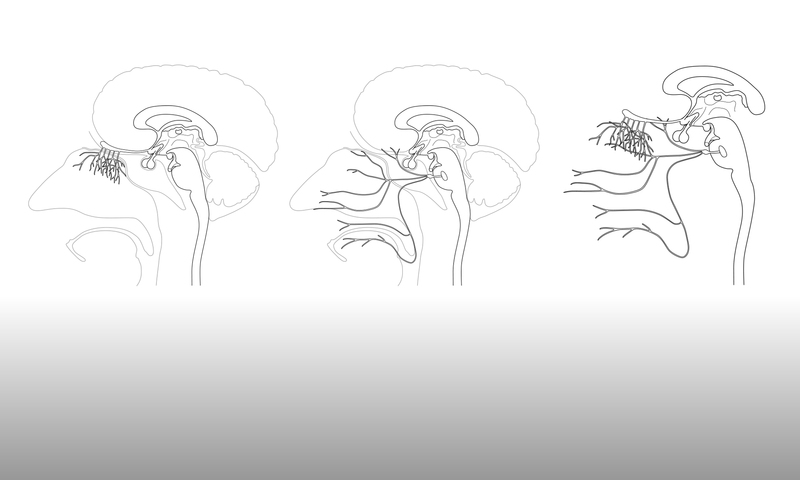 The figures above show a nice sequence from a very anatomical representation to a purely diagrammatic image, with the visual representation of the hypothalamus and pituitary being increasingly simplified from one figure to the next. The sixth and seventh images show how elements of a figure can be reused, as we’ve seen previously in the images of the olfactory epithelium. Representations of the nerves can range from the purely anatomical to the purely functional. The final two figures, in particular, are more reminiscent of electrical wiring diagrams than anatomical drawings, although in each case a simple outline image of the head and brain are still used to give context. As we move to the physically smaller visual elements, the representations are less likely to be anatomical, although the second image in the sequence above is by Frank Netter, a renowned medical illustrator. The later images, however, are much more functional and dispense with an anatomical context, relying instead on simple geometric representations and text labels. It is difficult to represent something as physically small as an individual neuron in an anatomically accurate manner. Most commonly, a stylised version of the neuron shape is used, and these shapes become progressively simpler and more geometrical in the sequence of images shown above. However, there is almost always some attempt to show at least an axon and dendrites, rather than just represent the neuron using a completely arbitrary geometric shape (as often happens for the nuclei). It is worth noting the sheer range of different visual representations included here and therefore the choices a scientist has to make in terms of their conceptual figures. Obviously, the exact science that they are trying to communicate will have a considerable bearing on the choice that is made. But does the availability of suitable figures that can be used or adapted, or the ability to draw a new figure to suit requirements, also have an influence on that choice? The next step is to discuss with the neuroscientists the factors that govern their decisions on what type of conceptual figure to use, and assess what can be done to make those decisions easier.